Download "Doctoral Study in Applied Developmental Psychology"
1 Doctoral Study in Applied Developmental Psychology Department of Psychology University of New Orleans College of Sciences New Orleans, LA With a Ph.D. in Applied Developmental Psychology from the University of New Orleans you will be prepared to teach at the college level, conduct research, and provide professional psychological services. Graduates from our program are currently in academic positions in higher education, working in government positions, and providing clinical services as licensed psychologists. Over the past four years, 100% of program graduates have had full-time job offers at graduation. 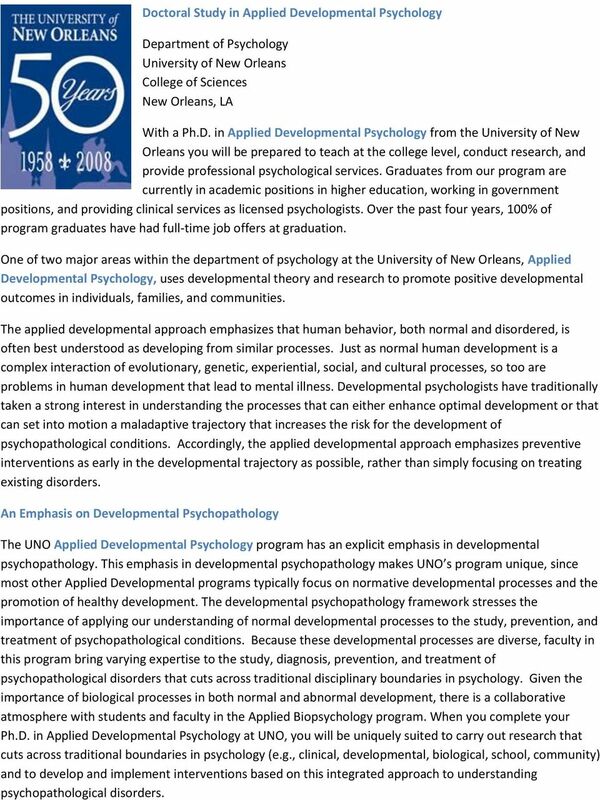 One of two major areas within the department of psychology at the University of New Orleans, Applied Developmental Psychology, uses developmental theory and research to promote positive developmental outcomes in individuals, families, and communities. The applied developmental approach emphasizes that human behavior, both normal and disordered, is often best understood as developing from similar processes. Just as normal human development is a complex interaction of evolutionary, genetic, experiential, social, and cultural processes, so too are problems in human development that lead to mental illness. Developmental psychologists have traditionally taken a strong interest in understanding the processes that can either enhance optimal development or that can set into motion a maladaptive trajectory that increases the risk for the development of psychopathological conditions. Accordingly, the applied developmental approach emphasizes preventive interventions as early in the developmental trajectory as possible, rather than simply focusing on treating existing disorders. 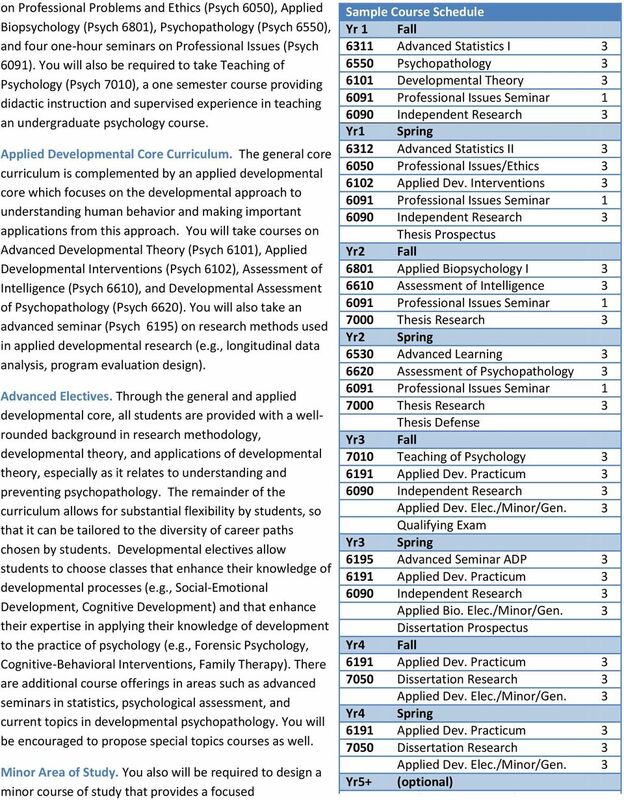 An Emphasis on Developmental Psychopathology The UNO Applied Developmental Psychology program has an explicit emphasis in developmental psychopathology. This emphasis in developmental psychopathology makes UNO s program unique, since most other Applied Developmental programs typically focus on normative developmental processes and the promotion of healthy development. The developmental psychopathology framework stresses the importance of applying our understanding of normal developmental processes to the study, prevention, and treatment of psychopathological conditions. Because these developmental processes are diverse, faculty in this program bring varying expertise to the study, diagnosis, prevention, and treatment of psychopathological disorders that cuts across traditional disciplinary boundaries in psychology. Given the importance of biological processes in both normal and abnormal development, there is a collaborative atmosphere with students and faculty in the Applied Biopsychology program. 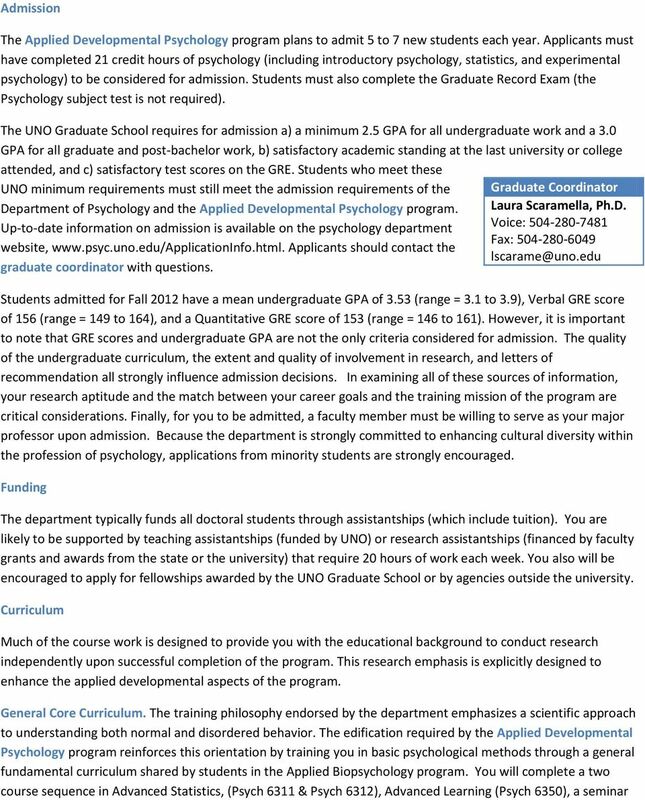 When you complete your Ph.D. in Applied Developmental Psychology at UNO, you will be uniquely suited to carry out research that cuts across traditional boundaries in psychology (e.g., clinical, developmental, biological, school, community) and to develop and implement interventions based on this integrated approach to understanding psychopathological disorders. 2 Training Orientation The training philosophy endorsed by the Applied Developmental Psychology program emphasizes a scientific approach to understanding both normal and disordered behavior, one that is heavily influenced by the developmental tradition, and which emphasizes the application of this knowledge to enhancing the development of individuals, families, and communities. The scientific emphasis of the program will prepare you to critically examine the practice of psychology and to advocate for improvements in the application of psychology based on scientific principles. Training scholars with these types of applied skills requires course work and research, but also practical experience in a variety of applied settings. UNO s urban location maximizes the opportunity for links with the medical and human services community that will provide you with various types of practical experience. 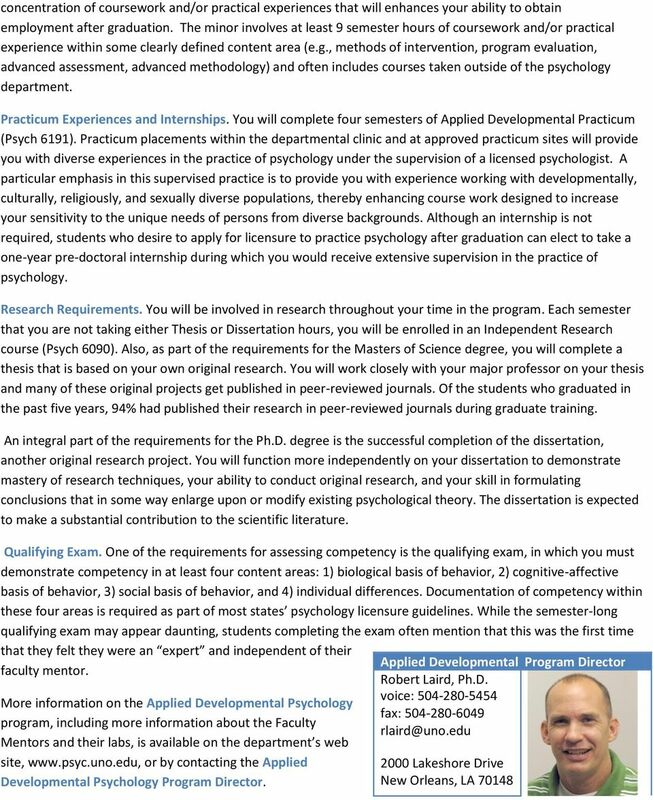 The Applied Developmental Psychology program shares with the department as a whole the commitment to training applied scientists who can contribute to the science of psychology by conducting innovative programmatic research and who can develop and implement practical applications of this research. 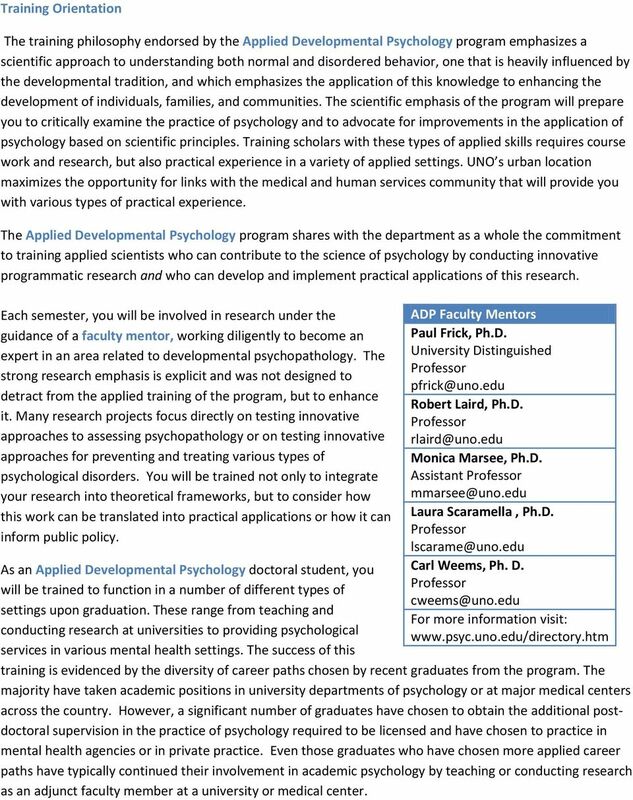 Each semester, you will be involved in research under the guidance of a faculty mentor, working diligently to become an expert in an area related to developmental psychopathology. The strong research emphasis is explicit and was not designed to detract from the applied training of the program, but to enhance it. Many research projects focus directly on testing innovative approaches to assessing psychopathology or on testing innovative approaches for preventing and treating various types of psychological disorders. You will be trained not only to integrate your research into theoretical frameworks, but to consider how this work can be translated into practical applications or how it can inform public policy. As an Applied Developmental Psychology doctoral student, you will be trained to function in a number of different types of settings upon graduation. These range from teaching and conducting research at universities to providing psychological services in various mental health settings. The success of this ADP Faculty Mentors Paul Frick, Ph.D. University Distinguished Robert Laird, Ph.D. Monica Marsee, Ph.D. Assistant Laura Scaramella, Ph.D. Carl Weems, Ph. D. For more information visit: training is evidenced by the diversity of career paths chosen by recent graduates from the program. The majority have taken academic positions in university departments of psychology or at major medical centers across the country. However, a significant number of graduates have chosen to obtain the additional postdoctoral supervision in the practice of psychology required to be licensed and have chosen to practice in mental health agencies or in private practice. Even those graduates who have chosen more applied career paths have typically continued their involvement in academic psychology by teaching or conducting research as an adjunct faculty member at a university or medical center. 2. State the job opportunities for graduates of the proposed program. Include evidence documenting those opportunities.